Gravity is the force that attracts things towards the centre of the Earth, keeping them firmly on the ground. For a bird to fly, it has to beat this force – and keep on beating it for as long as the bird is in the air. The lighter the bird, the less work it has to do to beat gravity. Drag is the resistance from air that pushes against the bird as it tries to fly.as text It may not seem that air is hard to push through, but it is actually a fluid that becomes harder to move through the faster you go. Just think about how walking into a strong wind is hard work – that’s what it’s like for a bird when it flies. Lift is the upwards force that birds use to beat gravity. It comes from the way that air moves as a fluid. When air moves quickly it is harder to push against in one direction, but it has less force pushing in all other directions or pressure. This means that if you have air moving faster over the top of something than underneath it, it will be lifted upwards by the low pressure above and the higher pressure underneath. Different shaped wings are better at different types of flying. 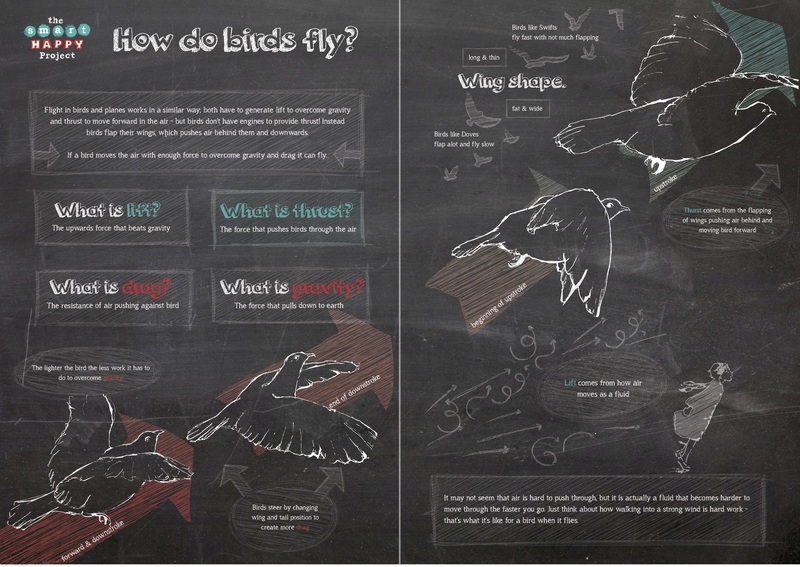 Thin wings have less drag than wide wings and long wings create more lift than short wings. So birds with long thin wings can fly without much flapping, while birds with short wide wings have to flap a lot. Steering in the air is done by moving the tail and changing the shape of the wings, so drag pulls on one side of the bird more than the other. This pulls the bird to the side with more drag and that changes its flight direction. Flight in birds and planes works in a similar way; both have to generate lift to overcome gravity and thrust to move forward in the air – but birds don’t have engines to provide thrust! Instead birds flap their wings, which pushes a bubble of air (called a vortex) behind them and downwards. Newton’s Third Law of Motion says that every action has an equal and opposite reaction, so that bubble of air pushes the bird up and forwards. If a bird moves the air with enough force to overcome gravity and drag it can fly. And now understand about Take-off which should not be underestimated! Take-off is hard work for a bird, because it has to make air flow over its wings very quickly to create lift. Some birds run, some fall from trees or cliffs and some jump into the air to get airflow over their wings started. Pigeons are very good fliers and they can take off going straight up without needing a run-up, but they start off with a big jump. The downwards part of a flap is called the downstroke and the first one during a pigeon take-off moves the wings through the air very fast. This downstroke pushes a lot of air downwards, forcing the bird upwards using thrust. When the wings are raised again during the upstroke, the pigeon flips them over so they keep pushing air downwards. When the wings meet at the top of the upstroke they clap together, then they come back down in another downstroke. By flapping like this the pigeon creates a powerful jet of air moving downwards that lifts it straight up very quickly.